Audi says its new Q2 has been deliberately designed to appeal to a 'younger audience'. A phrase that always ends with some sort of cringeworthy marketing image of 'young' people on skateboards in front of graffiti. Of course whether that many early 20-somethings can afford a car that starts at £21,000 is another matter. But it does at least go some way in explaining the bold (for Audi at least) if somewhat polarising looks. Whether you think it's a looker we'll leave up to you. But there's no denying that it's different from the usual rather conservative Audi fare in terms of styling. Of course what will have plenty of appeal is the fact there's an Audi badge on the (massive) grille, something which goes a huge way in giving this thing immediate desirability. It's not as different on the inside though. The Q2 echoes the A3, although that's certainly not a criticism. It has a neat design and a quality feel. There are some nice design touches like the circular air vents and the strip across the dash that not only comes in various colours but also lights up at night thanks to clever integrated LEDs. What's not as good is rear space. It's fine for youths in skinny jeans, but taller adults will find it short on head and leg room. The boot is good though with a wide opening and 405 litres of space that's ideal for pushchairs - sorry, skateboards. Audi’s neat Virtual Cockpit is an optional extra across the range (you can see it in the picture above) although only as part of the £1500 Technology Pack – which does include navigation, a better quality screen and an in-car Wi-Fi hotspot if you’re in need of such a thing. The fully digital instrument display is an impressive feature but it’s hard to justify shelling out so much extra for it. Get it out on the road, and for all of Audi’s talk of ‘go-kart like handling’ the Q2 is pretty much what you’d expect from an Audi. It’s easy rather than engaging to drive and can’t match a MINI for fun when it comes to handling. Essentially it feels like an A3 from behind the wheel – reassuring and composed but not especially exciting. There’s also a question mark over the ride quality. It’s far from poor but is on the firm side of comfortable, which is noticeable when you’re driving over cat’s eyes on the motorway. That was the case even when we drove lower spec cars on smaller 16-inch wheels, although S line versions on bigger alloys are not appreciably any worse. While the 1.4 TFSI CoD petrol will be the most popular model, the entry-level 1.0 TFSI – the only model to come in at under £21k – is in no way the poor relation. It’s the same engine used in the A1, A3 and the Volkswagen Polo among others. It may seem too small for a car like the Q2 – and indeed with 115PS it doesn’t set the world alight - but it is a surprisingly good fit. Don’t be put off by the fact it’s a three-cylinder engine either. There’s none of the usual vibration in the cabin and it’s not noisy thanks to good sound insulation. In fact it’s as refined as you’d expect from an Audi. Yet it still has the same eager nature and plenty of get up and go from low down, making the Q2 enjoyable to drive around town. It’s not out of its depth on the motorway either with little engine noise at higher revs and enough torque – 200Nm - to ensure you don’t have to keep changing down a gear when you want to accelerate at pace. Audi hasn’t revealed its official economy figures yet but expect the 1.0 TFSI to come in at 60mpg although in the real world you’re likely to see closer to the mid 40s. The only downside is that it doesn’t come in S line trim. If it’s outright economy you’re after then the 1.6 TDI is the best model, expect official economy to be around 70mpg. However, the 1.6 TDI is far from the best small diesel engine around. It’s noisy with a surprising amount of clatter when accelerating. Compared to the latest Renault 1.6 dCi it’s unrefined and feels dated. A 2.0 TDI is coming later in 2016 and will be available with quattro - although it will set you back £28k, not far short of an equivalent Q3. There are surprisingly few alternatives of this size that can compete with the pull of the Audi brand - apart from perhaps the MINI Countryman. But we have no doubt that the Q2 - like the A1 - will prove hugely popular. And not just with the 'youth'. 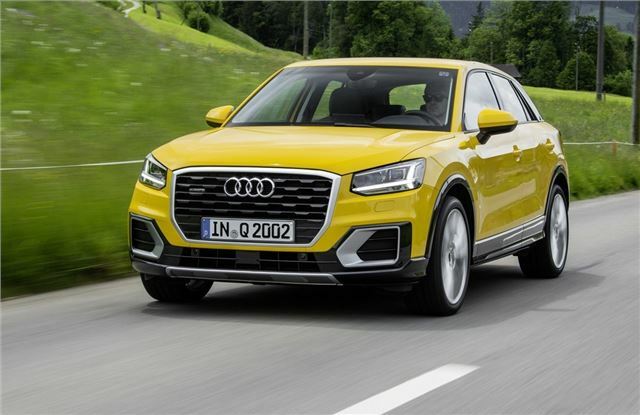 The Audi Q2 goes on sale in August with the first cars arriving in November.